A monument to LGBTQ vets now has official state recognition. California has become the first state in the nation to recognize LGBTQ military veterans. Gov. Jerry Brown signed into law a bill Monday designating the LGBTQ Veterans Memorial at the Desert Memorial Park in Cathedral City as the state’s official LGBTQ veterans memorial. The memorial park will continue to take care of maintenance. The memorial was established in 2001 by Frank Moulton AMVETS Post 66, based in Palm Springs, but until now it has not had state recognition. It consists of an obelisk of mahogany granite from South Dakota with the logo of the Gay, Lesbian, and Bisexual Veterans of America (the group is now known as American Veterans for Equal Rights). It was the first memorial in the nation to be dedicated to LGBTQ veterans, according to a press release from Post 66. 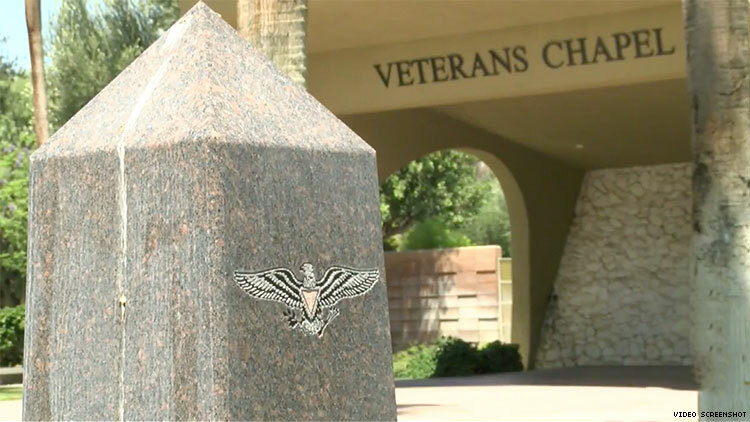 “Our memorial has become a holy place for people who want closure; people who were excluded from the military funerals of their loved ones, excluded from saying goodbye and having an opportunity to gain closure,” Tom Swann Hernandez, founder and current commander of Post 66, said at a veterans’ event last month in Palm Springs, the city’s Desert Sun newspaper reports. Hernandez, a veteran of the Marine Corps and the Navy Reserve, testified before the legislature in favor of having the memorial officially recognized by the state. Legislation to this effect had been introduced and even passed before, but Gov. Arnold Schwarzenegger vetoed such a bill in 2004, Post 66 officials said. “People said, ‘Well, if you have a gay veterans memorial, then we’ll have one for left-handed veterans one day, for right-handed veterans,’” Hernandez said at the July event. They tried to diminish the importance of the memorial, but we were bold and we did not give up,” he said. The new bill, Assembly Bill 2439, passed with bipartisan support, whereas earlier attempts were opposed by Republicans. Both Hernandez and Assemblymember Eduardo Garcia, AB 2439’s chief sponsor, have stressed the importance of honoring LGBTQ veterans because of the lengths to which they have had to go in order to serve in the military. Hernandez fought back — successfully — when the Navy attempted to discharge him after he came out in 1992. Now, 26 years later, Donald Trump is attempting to bar transgender people from serving. “It doesn’t seem to be getting any easier for our LGBTQ community to continue to fight for the inclusiveness that you — the men and women in uniform — have fought to ensure,” Garcia said at the veterans’ event. Post 66 is planning a special dedication ceremony for the monument in November and has invited Gov. Brown to attend.